Destiny Bohanon drives down the baseline past Fairmont defender Makira Webster. Aubryanna Hall scores a jump shot between Madeline Westbeld (left) and Mali Morgan-Elliott. 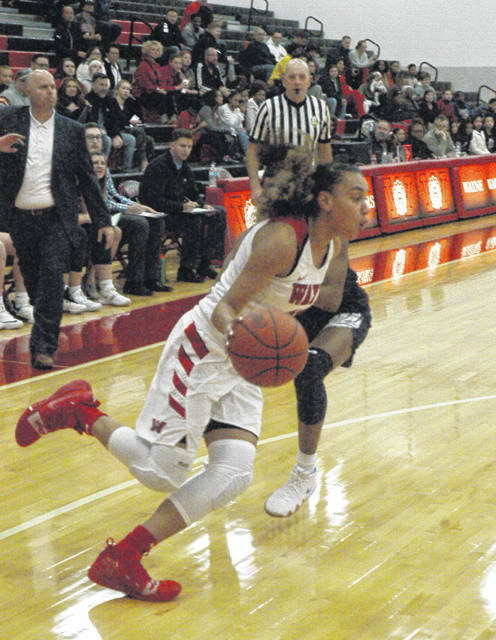 Olivia Trice (left) and Nyla Hampton trap Makira Webster in the backcourt to force a turnover. 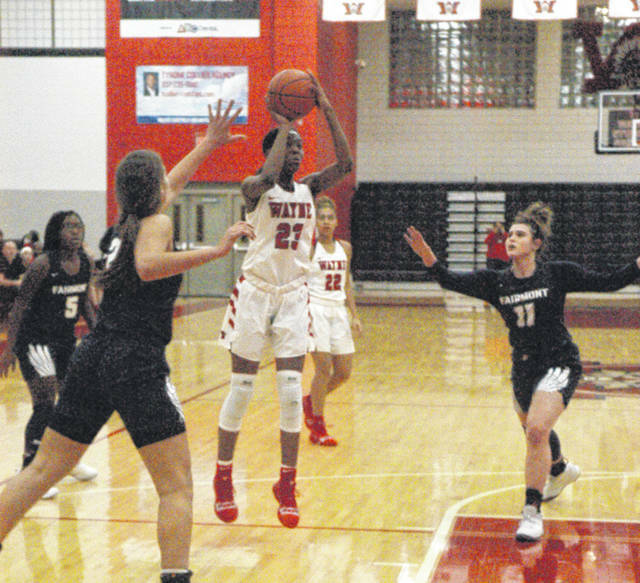 HUBER HEIGHTS – With a 63-48 victory Wednesday over division rival Fairmont the Wayne girls basketball team won its third straight game to open the season. 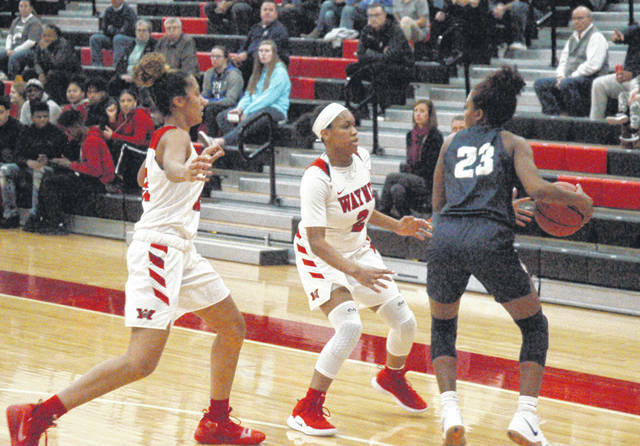 Against Fairmont Wayne was led by Destiny Bohanon with 24 points including four 3-pointers while Nyla Hampton tossed in 12 and Aubryanna Hall added 11 to pace the Lady Warriors attack. Fairmont’s twin towers, 6-foot, 2-inch Madeline Westbeld and 6-foot, 3-inch Madison Bartley were no match for Wayne’s quickness. Wayne limited Westbeld to three first half points and nine overall while Bartley scored eight of her team leading 14 points in the second half when Wayne led by double figures. The first quarter saw Fairmont take a late 17-13 lead on a pair of free throws and back-to-back baskets by junior guard Makira Webster. Bohannon countered with a 3-pointer and Hampton scored inside the key to put Wayne up 18-17 at the end of the quarter. From there Wayne’s defensive pressure limited Fairmont to only three more points the remainder of the half as the Lady Warriors opened up a 36-20 halftime lead. Hampton and Bohanon each came up with a steal and scored early in the second quarter to set the tone. Wayne went on a 9-0 run to take a 31-19 lead. Angel Brown came off the bench to bury a 3-pointer late in the first half to boost the lead to 16 at the break. After leading the Wayne boys basketball program for several years second year coach Travis Trice is pleased with his team’s 3-0 start. Wayne maintained a 13 point cushion after three quarters before Fairmont started chipping away at the lead. The Lady Firebirds closed the gap to 49-40 with 4:28 remaining. Wayne came up with a steal in the Fairmont backcourt with Olivia Trice drawing a foul and converting both free throws. Bohanon came up with a steal and got fouled as well and also sank both shots. Hall followed with basket and Trice buried a 3-pointer as Wayne re-established control 60-42 with 1:48 remaining. Wayne plays at Beavercreek on Wednesday and on Monday, Dec. 10 travels to Wilmington. Fairmont: Kierra Thornton 3-1-8, Mali Morgan-Elliott 3-2-8, Madeline Westbeld 3-3-9, Madison Bartley 5-4-14, Makira Webster 3-2-8, Emma Martcheva 0-1-1. Totals: 16-14-48. Wayne: Charity Miller 0-1-1, Nyla Hampton 5-2-12, Angel Brown 1-0-3, Kyra Willis 1-2-4, Destiny Bohanon 8-4-24, Olivia Trice 2-2-8, Aubryanna Hall 5-1-11, Jaida Wolfork 0-1-1. Totals: 22-13-63. 3-point goals: Fairmont 2 (Thornton, Bartley); Wayne 7 (Bohanon 4, Trice 2, Brown). Records: Fairmont 1-2 (0-1), Wayne 3-0 (1-0).